Raaga.com: Shah Rukh Khan and Salman Khan to clash on Eid while Rajinikanth and Mahesh Babu to clash on Tamil New Year!! Shah Rukh Khan and Salman Khan to clash on Eid while Rajinikanth and Mahesh Babu to clash on Tamil New Year!! 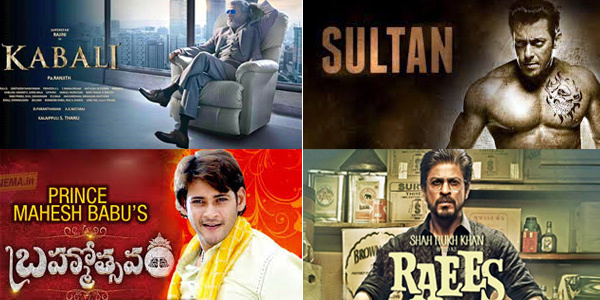 It seems the year 2016 will go down in the annals of Indian Cinema as the Year of ‘Colossal Clashes of Indian Cinema’ because it is not just Bollywood that will witness the clash of Bollywood’s two mega stars Shah Rukh Khan and Salman Khan but it will also see a never before clash down Southern film industry with veteran Superstars Rajinikanth and contemporary superstar Mahesh Babu clashing at the box office to encase the Tamil New Year! According to recent reports just as there is a tug of war between Bollywood mega stars Shah Rukh Khan and Salman Khan to bank the festive occasion of Muslim festival Eid likewise down South Superstar Rajinikanth and Mahesh Babu would be at loggerheads to reap the dividends of Tamil New Year. Since Salman Khan is known for releasing his films on Eid and is famous for winning rich dividends (Remember KICK, WANTED, BODYGUARD, EK THA TIGER, DABANGG and his latest BAJRANGI BHAIJAAN) hence he is adamant on releasing his film SULTAN on Eid. On the other hand Shah Rukh Khan, who usually prefers to release his films on Diwali this time is insisting on releasing his film RAEES on Eid because he plays a Muslim character in the film. Hence he is eying to exploit the sentiments of Muslim community and what better occasion than Eid festival. Meanwhile Rajinikanth’s much publicized upcoming film KABALI that was earlier announced to release on the Tamil New Year in 2016 has found an obstacle in its path because reports have it the other mega star of Telugu film industry Mahesh Babu too plans to release his most expensive film BRAHMOTSAVAM at the same time. Reports claim that since Mahesh Babu is making his debut in Tamil films with BRAHMOTSAVAM hence to be on a safer side he has decided to release the film on Tamil New Year and exploit the festive mood.